For a boat and crew/guests coming to the event. Any group coming to the event without a boat. For an individual without boat coming to the event. We are the guests of the Jones family who own Jones Boatyard at St Ives. This has been the base for several SBA rallies in the past. With its excellent slipway and its other facilities it should again provide us with a great base for the rally. Turn off the A14 at junction 26 and head for St Ives. After about one mile turn right at the roundabout. A few hundred metres on the left is the entrance to Jones boatyard. On Google maps enter “Jonesboatyard (LH Jones and Son Ltd)” I will include a map with rally information which is sent out by post. Boats can be launched from noon onwards when I will be present. Moorings will be allocated on arrival. There will be a Barbecue in the evening alongside the boats with a marquee. The cost will be £12 per head. You will need to bring your own drinks. Head upstream towards Huntingdon and Godmanchester. The bridge at St Ives which has a chapel built on it dates from about 1425. After the first lock (Hemingford) we go past Hemingford Grey village, this stretch of river to the next lock is one of the most attractive around. In the village of Hemingford Grey is the second oldest continuously inhabited house in England dating from the 12C. At Houghton lock (second lock) is Houghton Mill a working water mill owned by the National Trust and they serve teas in the afternoon. The bridge at Huntingdon was built in 1332. Go through the third lock (Godmanchester) and then just before the next (Brampton) is Brampton Mill (13Kms 8 Ms) an old water mill with working water wheel. This is a cafe and restaurant where we can buy drinks and lunch. If you wish to picnic there is an area just down river from the mill. The dinner in the evening will be at the Pike and Eel which is beside the river (about 8Kms 5 Ms) downstream where many of the French party will be staying. Cost will be £20per head. Chose yoiur menu on booking form. Pay Restaurant at end of meal. Given the time of year there should be plenty of light for those who wish to steam down to the restaurant (one lock) and I intend to take URSULA. Head downstream towards Earith. The first lock is right after leaving the marina. You will go past the Old Ferry Boat Inn and the Pike and Eel Hotel and Restaurant. Further on we will come to Brownshill Staunch which is a lock with guillotine gates at either end. This is because the river is now tidal from here to Kings Lynn via the 100 foot drain, over 64Kms / 40 miles away. I suggest that assuming we get away from St Ives at reasonable time we can go through to Earith and then back to the Pike and Eel for lunch. There is at least one cafe /restaurant beside the river in Earith but my last visit there was not impressive. In the past, including last year, we have seen a seal (phoque in French) with young in this area! 1 Visit Cambridge going via the new guided bus from St. Ives to the centre of Cambridge. I should however point out that many of the colleges may be closed due to exams taking place. There is still plenty to see and may be go punting along the backs. 2 Bring your boats on their trailers to a launching point on the River Cam and have an 18Km round trip up to Cambridge and back. You can steam from St. Ives to Cambridge but it is 48Kms. This excellent slipway has been improved to make it one of the best I know. There will be a charge of £12 for each boat for slipping and mooring. There is secure parking for our trailers. The navigation authority for the river is the Environment Agency. We will have free use of the river for the weekend courtesy of them. 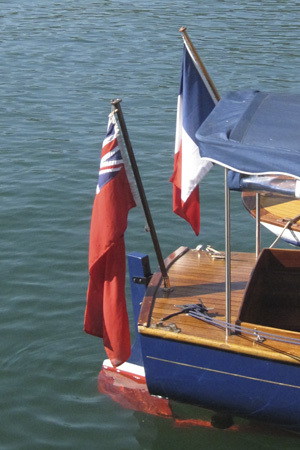 The plan is for each French boat to be paired with a British boat whose crew will be able to operate the locks as all the locks are unmanned and worked by the boat crews. This area of England has locks which have vertical lock gates known as guillotine gates and they are electrically powered. A special key is needed to access the controls and I will be hiring out keys for £5 each. The three locks up stream have guillotine gates at the upstream end, V gates at the downstream end. The lock downstream of Jones has the gates the other way round. Brownshill staunch has guillotine gates at either end. The V gate paddles have a larger square lug onto which the windlass fits so your BW one may not fit. Borrowing these large size ones is more difficult but Jones will sell you one. The best way is to stick with other boats that have one. For those people coming without a boat I will do my best to arrange spaces on boats attending but these cannot be guaranteed. These can be accommodated on a nearby field belonging to the Jones family. All boats much have third party insurance in place and details will need to be provided on the booking form. Five French and One Dutch boat are confirmed as coming. 21 High Street, Landbeach, Cambridge CB25 9FR. Mobile 07847 017582 – will be on during rally. Les membres de la SBA sont cordialement priées de participer. The ABV would like to invite SBA members to their event in the UK.